New EU accounting rules allows European banks to sell bad loans without immediately taking a hit to their profits or balance sheets. Italian and Greek banks, holding huge amounts of bad-loans, have been prolific users of this new accounting standard. Regulators are now worried that the banks have front-loaded all provisions, in essence not fully dealing with the underlying problem, but just kicking the can down the road. 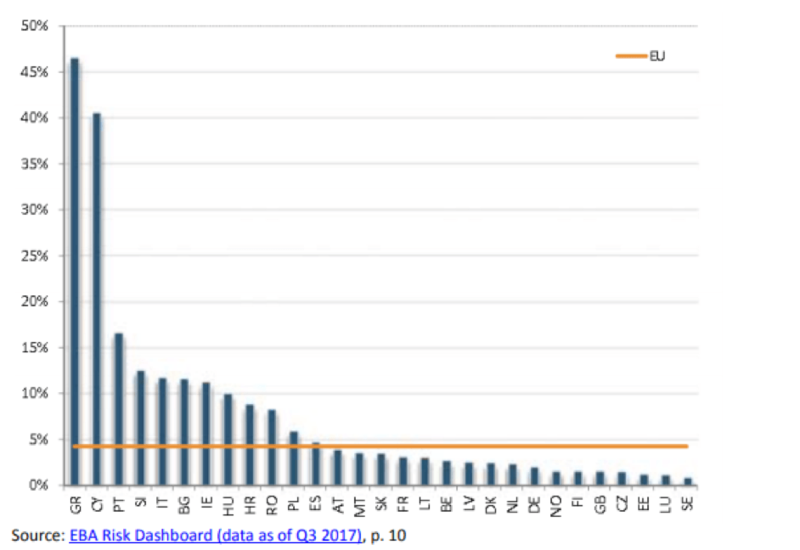 Banks in Europe, especially southern European have been plagued with massive amounts of Non-Performing Loans (“NPLs”) hampering the health, economic and financial well being of the banks and the countries there are active within. Italian and Greek banks have been the main banks with elevated levels of NPLs. In Greece, the level was around 45%, whilst it was above 10% in Italy (data late 2017). A shift in accounting standards means that they can sell off the old loans without declaring an accounting loss or clobbering their regulatory capital, allowing Italian and Greek banks in particular to cleanse their balance sheets of old problems. In others words, banks can sell bad-loans and not take any hit to their profits. They will not need to mark-to-market the sale, instead they increase the bad-loans provisions. This allows them avoid breaking the regulatory requirements for the banks. EU regulators allow banks up to a five year period to write-down the provisions from the sales. Italian and Greek banks have taken advantage of this new regulatory change. For example Unicredit (UCG IM) and Intensa (ISP IM) have already offloaded a massive portfolio of bad loans. EU is now worried that some banks have front-loaded provisions to their benefit, not fully dealing with the problem, but simply kicking the can down the road.